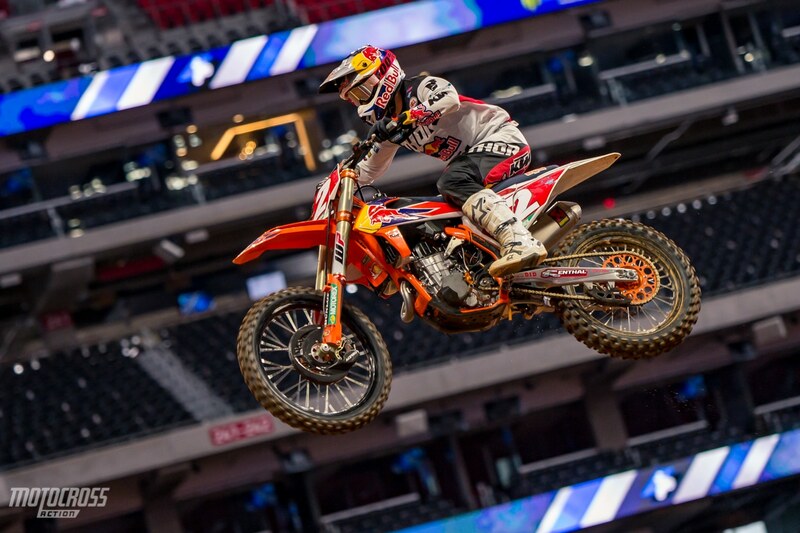 The ninth round of the 2019 Monster Energy AMA Supercross, an FIM World Championship, was held at the closest venue North Carolina rider Cooper Webb of the Red Bull KTM team would have to a home race, and he led the race from start to finish to the cheers of 59,107 southern fans. 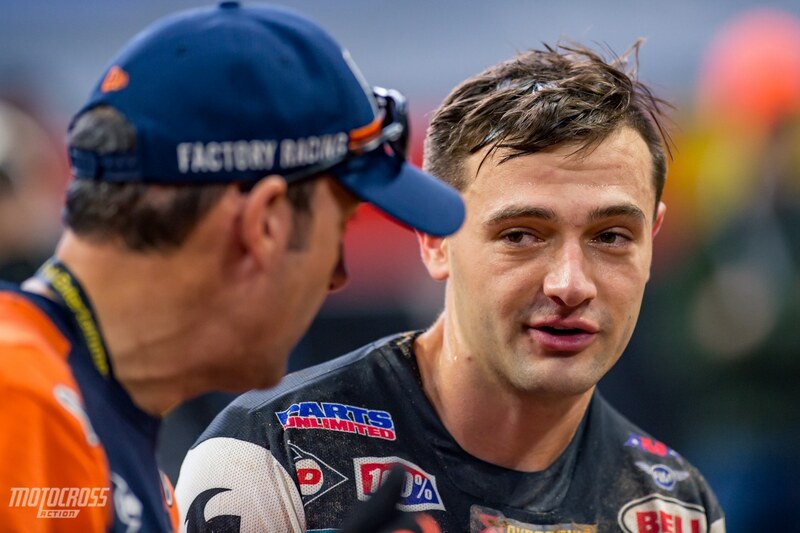 It wasn’t an easy win as he had a near constant attack from Red Bull KTM teammate Marvin Musquin and Team Rocky Mountain ATV/MC KTM WPS’ Blake Baggett. The 250SX Regional Classes saw the first of two East/West Showdowns of the year, where riders from each series compete for the same points payout in one race. 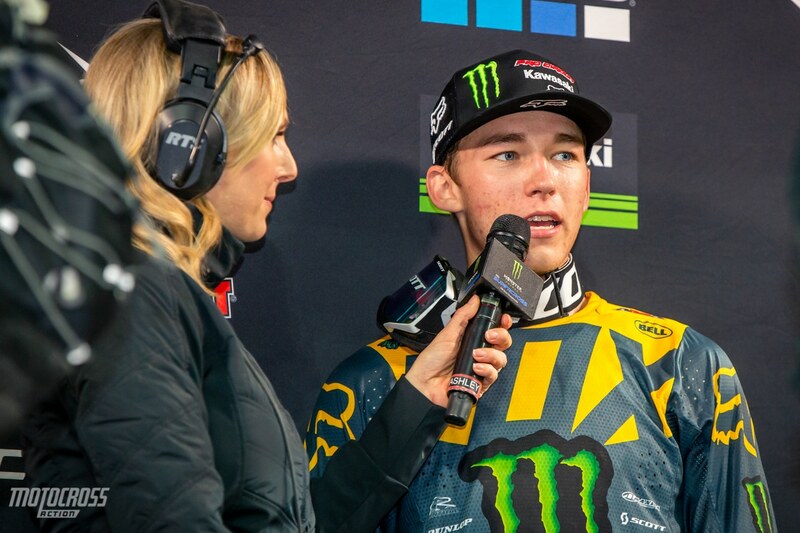 It was Western Regional 250SX Class riders taking the first two positions, with points leader Monster Energy/Pro Circuit Kawasaki’s Adam Cianciarulo getting to the checkers first. When the 450SX Class Main Event racers emerged from the first turn, it was points leader Cooper Webb emerging with the holeshot. Within a few turns there were three KTMs out front: Webb, Musquin, and Baggett. The rider who sat second in points, Team Honda HRC’s Ken Roczen, sat sixth behind Monster Energy Yamaha Factory Racing’s Aaron Plessinger. 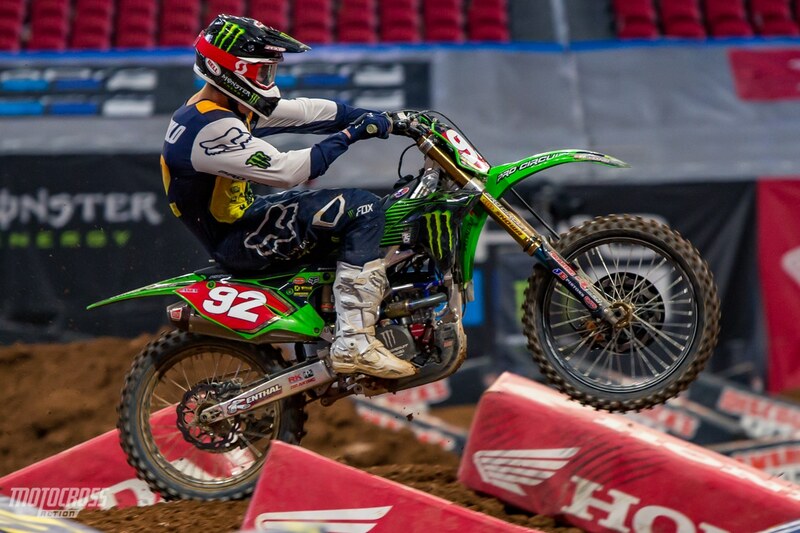 Monster Energy Kawasaki’s Eli Tomac, who had a poor gate pick after an eighth place in his Heat Race, was back in thirteenth. Just past the halfway mark, Musquin’s front wheel went over the inside berm in the sand section and Baggett got by. Baggett put on a charge for the lead, but Webb remained composed on the soft track that was rutting up badly. By the last lap Cooper had what he’d have to call a comfortable lead for this battle – just 1.5 seconds. Behind him Musquin made a last lap charge for second but was unable to pass. 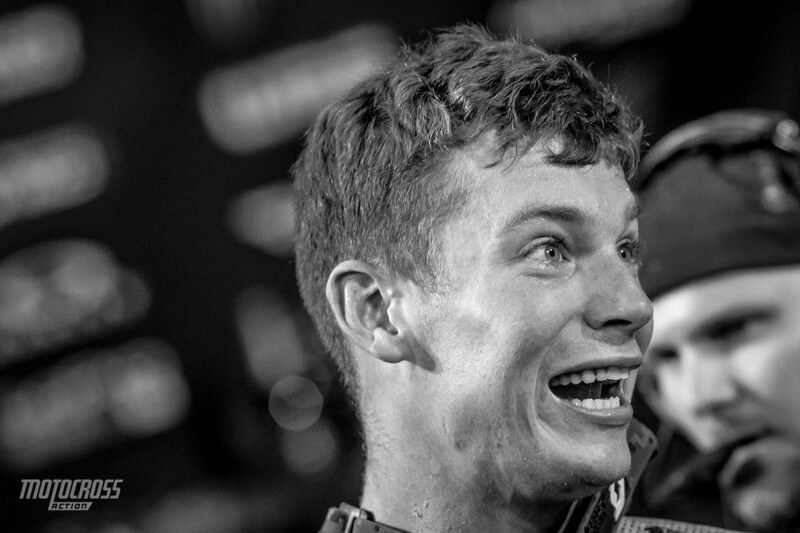 The win stretched Webb’s points lead to 13 over Ken Roczen. 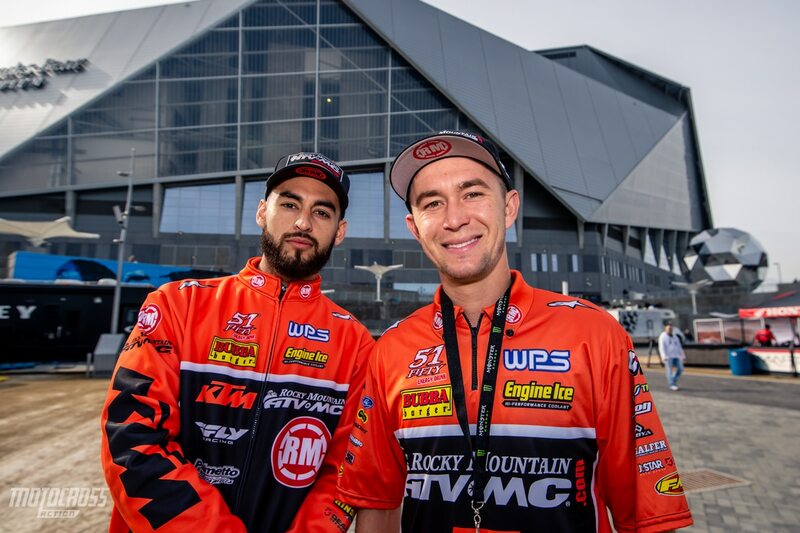 The first of two 2019 East/West Showdowns found the East Coast riders racing their fourth round and the West Coast riders, who have been off for three weekends, competing in their sixth round. Monster Energy/Pro Circuit Kawasaki’s Austin Forkner grabbed the holeshot with teammate Adam Cianciarulo right behind. It looked like the teammates, who each led their points in their respective series, would go to battle but GEICO Honda’s Chase Sexton slipped past into the runner up spot. 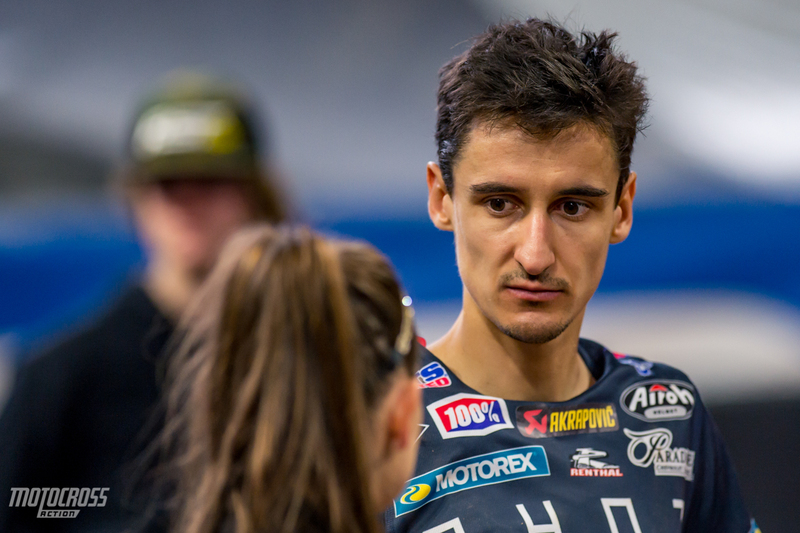 Cianciarulo stayed close, then pulled back up, and just over six minutes into the 15-minute plus one lap Main Event got back around Sexton and started setting faster lap times than his teammate just ahead of him. 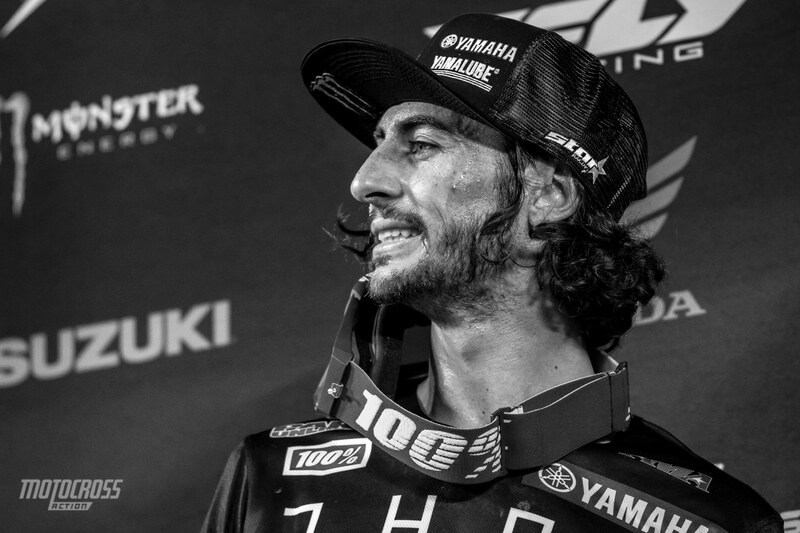 Behind them Monster Energy/Star Racing/Yamaha’s Dylan Ferrandis also got past Sexton. Ten minutes into the race Cianciarulo passed his teammate, and one lap later Ferrandis also went by Forkner. That’s where the top three racers stayed, giving the top two spots to Western Regional 250SX Class riders. The unique regional mash up allowed both division leaders to stretch out their points leads over many of their competitors, bringing the East Coast lead to 18 and the West Coast lead to 15.